Have you been looking for a way to connect with other moms? Looking for a creative outlet? Needing the time and space to work on fun projects? This event is for you! 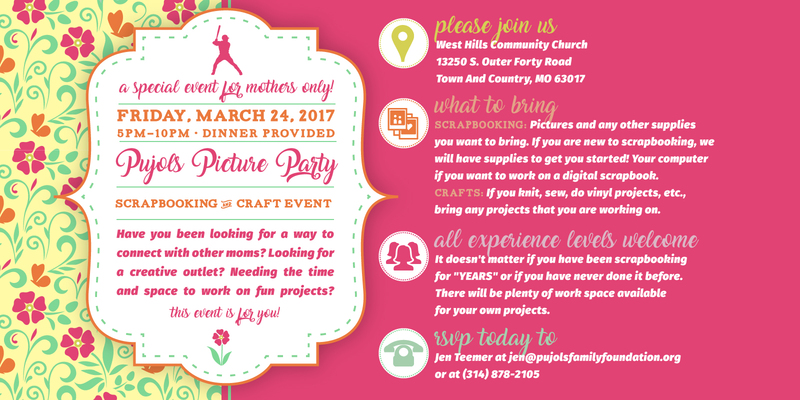 This Mothers only event is on Friday, March 24th from 5-10PM at West Hills Church. We will provide dinner as well. What to bring? Scrapbooking: Pictures and any other supplies you want to bring. If you are new to scrapbooking, we will have supplies to get you started! Your computer if you want to work on a digital scrapbook. Crafts: . If you knit, sew, do vinyl projects, etc., bring any projects that you are working on. All Experience Levels Welcome: It doesn’t matter if you have been scrapbooking for “YEARS” or if you have never done it before. There will be plenty of work space available for your own projects. Please RSVP by calling Jen Teemer at (314) 878-2105.